Either type the Employee ID or name (last,first)—it searches as you type. For an enhanced search, type last name [space] first name to find the “first” name within the name (for example, when an employee goes by their middle name). Choose a Fiscal Year and Quarter (Current Fiscal Year and Quarter are defaulted. Reallocations for Activities and/or BU 02 Orgs can be made in previous quarters, provided a PAR does not exist). Clicking the Add Chartfield (or Add Multiple Chartfields) button and manually entering a new Chartfield, putting either a percentage or an amount in the appropriate field. Clicking the Add Chartfields by File Upload button to automatically add Chartfield lines to an EDR from a .csv file. Save: this saves your work on the EDR in its current state, no matter if a Chartfield is incorrect, not fully entered, or even if there is a Remaining balance. The Processing State at the top of the page will show it is being prepared. Validate: this will check to see if it is ready to Submit. It does NOT save your work. Trash: this deletes the EDR. Submit: this will both save and validate, putting it at Submit status in the Processing State (if it passes validation). Central Administration will then take it from there. Optional notes can also be added to the audit record. Recycle: this takes the EDR out of Submit status, and back to Preparing. Upload Attachment: PDF files can be uploaded to the EDR. A paperclip icon will appear in the top right corner of the screen when an attachment exists. Click the paperclip or the Upload Attachment button to view. Blue messages are informational only. Red messages are errors that need corrective action in order to pass validation. Yellow messages are warnings, but need no action. The Total Effort Earnings must equal the Total Corrected Earnings (Remaining must be zero). The Corr Ben Amount Total does not need to balance to zero. Any difference will be handled by Central Administration. If there is more than one Employee Record Number, than the Total Effort Earnings must equal the Total Corrected Earnings at the Employee Record Number level. Chartfields must be valid and not duplicated. A Project must have the appropriate earnings according to the start and end dates (e.g., if a Project starts or ends in the middle of a quarter, the earnings cannot be for the full quarter). 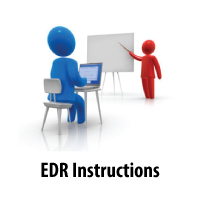 Run the EDR Preparer’s Worklist to find EDRs and ePARs created by a particular Preparer. Either type the Employee ID or name (last,first)—it searches as you type. For an enhanced search, type last name [space] first name to find the “first” name within the name (for example, when an employee goes by their middle name). Choose a Fiscal Year and prior Quarter. If any ePARs have been routed for review, the assigned reviewer can look up their list on the My Review List tab, located right on the main Search Page. They may have also received an optional system email with the link. Routing for Review is an optional process that some departments may decide to use. If there are ePARs in Review state assigned to you, it will say so automatically at the bottom of the screen. Either click on that text, or click on the My Review List tab. Click the employee name to view the ePAR. Once the state changes, it will disappear from the list. Quick Tip: the employee’s ePAR will open in a new tab. After reviewing the information, if Request Certification or Recycle is clicked, the state will change. Close out that tab to return to your list. Click Search/Refresh List to refresh the list and show the most current ePARs still in Review state. Run a list of employees required to certify their effort by using this search,found by clicking the “PAR List by Home Department” tab (visible for those with D-Jobs access). Enter the Home Department needed (with optional Org rollup), and the Fiscal Year and prior Quarter. Click on the name of the employee to bring up their ePAR for that quarter. This is also a monitoring tool, which displays the Last Action taken for the electronic PAR. If an employee is not on the list because a manual PAR needs to be created, simply look up the employee in the main Search Page and bring up their out-of-quarter EDR. Once a Project is added, it automatically becomes an ePAR. When it reaches Complete state, it will then show up on the list. The employee’s ePAR will open in a new tab. After saving or clicking Request Certification, close out that tab to easily come back to the list. Clicking the Search/Refresh List button again will refresh the list, and display the most recent Last Action. Try out the Gather button to sort the list in different ways to help you manage the ePARs, including options to create PDF bundles and the ability to send a reminder or other quick personal message to those selected. The ePAR can also be saved and certification requested with no changes. Hover over the Project number to see the Agency name. Hover over the Project short title to see the long title. Sticky note feature: temporary notes can be added to the ePAR that anyone can see, by clicking the sticky note icon in the top right corner of the screen. Upon moving to Complete or Complete (No Change), the sticky note will be permanently deleted. Save: this saves your work on the ePAR in its current state, no matter if a Chartfield is incorrect, not fully entered, or even if there is a Remaining balance. The Processing State at the top of the page will show it is being prepared. Validate: this will check for errors to see if it is ready to Request Certification or Route for Review. It does NOT save your work. Trash: this deletes the ePAR. Route for Review (optional): this routes the ePAR for review by another person. This is an optional step, and can be used by those departments who follow this business process. It saves and validates, puts the ePAR in Review state, and allows the user to assign the reviewer(s) and whether to notify them by email. The reviewer can find a list of ePARs ready for their review under the My Review List tab on the main Search Page. Request Certification: this will both save and validate, putting the ePAR at Awaiting Certification in the Processing State (if it passes validation). An optional email notification can be sent to the employee to let them know their ePAR is ready to be reviewed and certified. Certify: the employee or responsible official can certify the ePAR, which records who certified and when. It either moves to Submitted state, where Central Administration will review and complete, or it goes right to Complete (No Change). Recycle: this takes the ePAR back to Preparing state. If you feel it accurately reflects your effort for the quarter, click the Certify button. Your certification is now complete, and you may leave the application. If you feel it needs changes, click Recycle. This brings it back to Preparing state, and sends a system email notification to the Preparer of your ePAR. Either you or your department administrator can make the appropriate changes and save. Afterward, your department administrator will need to Request Certification from you again. Additionally, K Awards and HHS Projects where the HHS Cap applies will be flagged at the Chartfield line, as well as at the top of the ePAR. These flags are reminders to review that requirements are being met. Within the EDR application, those with D-Jobs access can also run quick and simple tracking of ePARs using the PAR List by Home Department. Look at the Last Action column to see where the ePARs currently stand in the process. Using the Gather button, you can even send a reminder note or other personal message to any manually selected employees on the list.